and kept wandering around in the big G of "Goodyear"
for a hundred and twenty kilometers. Outward bound across the great, cloud-illumined Sahara. Born in Oslo, March 08, 1907, Rolf Jacobsen is considered the father of modern Norwegian poetry. Jacobsen's poems record the extraordinary changes that take place as we move from an agrarian to an industrial society. Garnering the highest praise of critics, Jacobsen won many of Norway's and Sweden's most prestigious literary awards, including the Swedish Academy's Dobloug Prize and the Grand Nordic Prize, also known as the "Little Nobel." But he also has earned a wide popular audience, because ordinary readers can understand and enjoy the way he explores the complex counterpoint of nature and technology, progress and self-destruction, daily life and cosmic wonder. "North in the World" is an outstanding collection of his poetry brilliantly translated by the American poet Roger Greenwald . The above poem is drawn from this book. 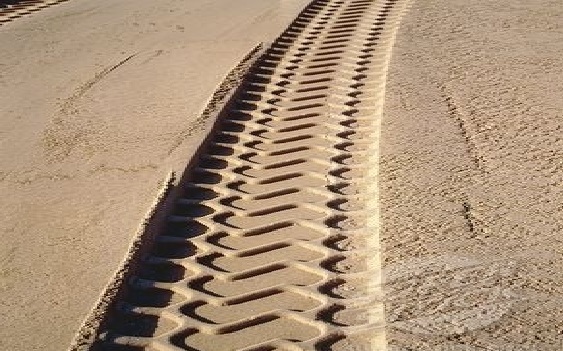 The poem "Rubber" is conceptually wonderful and narrows down our attention to the imprints left by the tyres of a car and the plight of an ant carrying a pine needle that gets trapped in the indentation of the tyre left in the soil. The drama suddenly turns into an epic struggle. For an ant , this apparently small depression is like a deep well. Jacobsen draws us down from our six-foot perspective to the world of the small ant, where a sandy country road becomes as vast as "the great, cloud-illuminated Sahara". As soon as the image of the desert appears, we see that the ant is analogous to a person struggling against overwhelming forces in a world whose scale he can hardly grasp. But this poem must surely prick the conscience of any sensitive reader, for the trap is man-made, so the closing image refers at the same time to the damage we have inflicted on our environment and thus on our own capacity to thrive. Ref: North in the World: Selected Poems of Rolf Jacobsen - A Bilingual Edition. Translated and edited by Roger Greenwald. University of Chicago Press, 2002. We challenged the ant to step up and make a little progress and for that any ant is grateful as we are all grateful for the challenges we meet. This morning I thanked the young woodpecker for removing worms from peaches I was guarding. We learn everyday.